Dynamite Comics have carved a great niche for themselves as the home of pulp superheroes like The Shadow, The Green Hornet and The Bionic Man. Black Bat is the newest superhero to join this illustrious line up with his own title released this week. 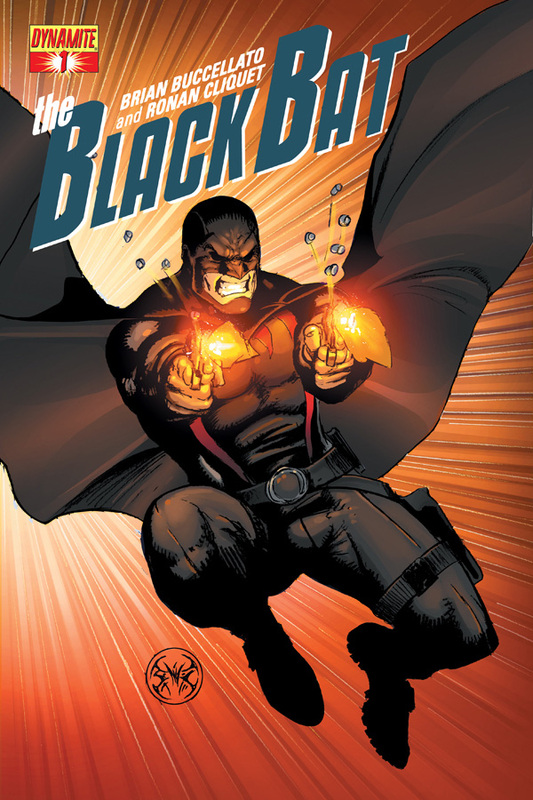 However instead of harking back to the golden age of 50s superheroes, Black Bat instead feels like a throwback to the gritty world of the late 70s and 80s when comics started getting a darker edge and became more than just funny books for kids. The Bat’s back story further strengthens that association as lawyer Tony Quinn is blinded by thugs and his eyes are replaced with bionic ones, which give him a ghoulish bat like quality. Setting out for revenge, he dons a black cowl and goes out to get revenge in the men who took his sight, as well as search for who is kidnapping police officers, starting with mafia thug The Brute. So in short it’s Frank Miller’s Daredevil meets Frank Miller’s Batman, which in our books is no bad thing at all! Especially when the art is very reminiscent of David Mazzuchellis work in Batman Year One! At a a time when so many superhero books are still lingering in the manga-infused style of the late 90s, having a gritty and dark superhero book is pretty refreshing. With a strong use of shadows and excellent eye for composition and dynamic pages artist Ronan Cliquet creates a strong, classy look for the character and is ably backed up by some subtle, moody colouring from Mat Lopes which fills the book with stylish sepia tones and an almost monochromatic colour scheme which further helps give the book an old school, Miller-esque feel. But its not all about the art, there is a strong script underneath these moody visuals from writer Brian Buccellato. This opening chapter starts with a bang and uses a great elliptical story which mixes back story and flashbacks with the current events to create an excellent balance of action and exposition. Although the story itself is not stunningly original and there is nothing in this first issue that really makes it stand out from the crowd, its still a solid first issue that creates a strong foundation for the character to build from. This could be a sleeper hit! With a strong script and some stylish moody visuals, this first issue does a good job of introducing us to this new hero/detective/vigilante. Unfortunately, it doesn’t feel startlingly original, with Daredevil meets Batman origins, so in a crowded market place doesn’t do enough stand out from the crowd and feels like just another superhero vigilante.